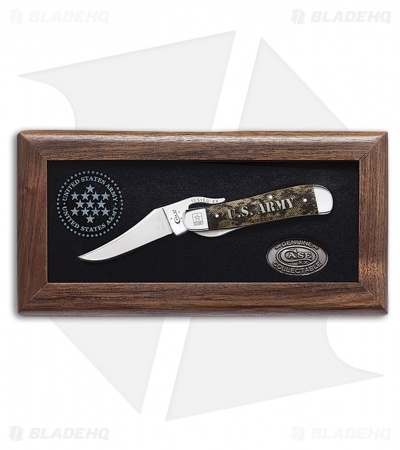 The Case US Army Russlock Commemorate gift set is sure to be a treasured piece in any collection. Natural bone scales are laser engraved for a camouflage pattern with U.S. Army. Polished nickel silver bolsters are etched with the US Army Star. Tru-Sharp stainless steel blade is nestled in a a plush wooden glass topped display case. Includes Case collectible medallion.